There is no other way to make oneself feel more DIY than hand-wrapping a zillion tiny caramels in small squares of waxed paper. After spending more time doing this than I’d like to admit, I have a greater respect for candy makers everywhere. 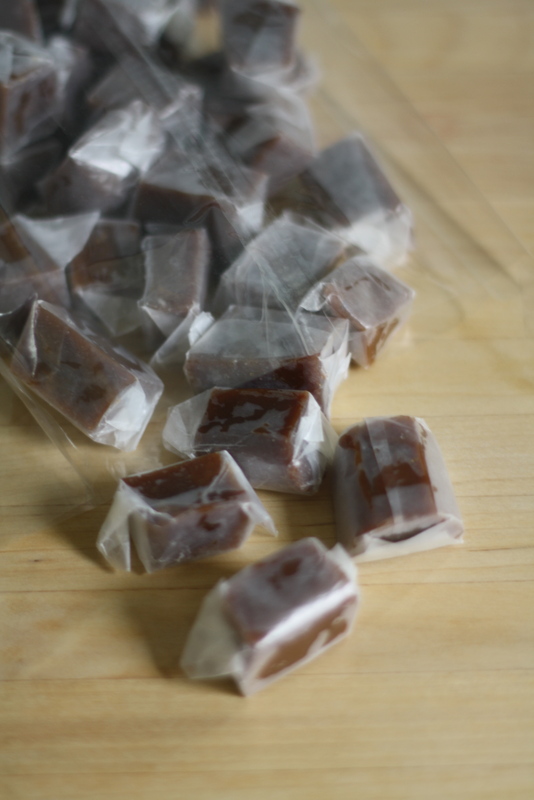 I’ve tried a few times to get the courage up and start making caramel. 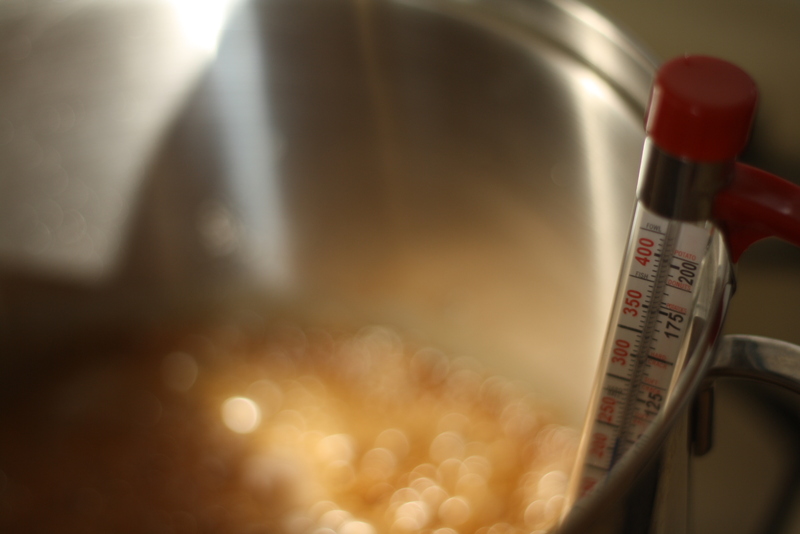 But I always backed out because I was too intimidated to use my candy thermometer and would made a cake instead. 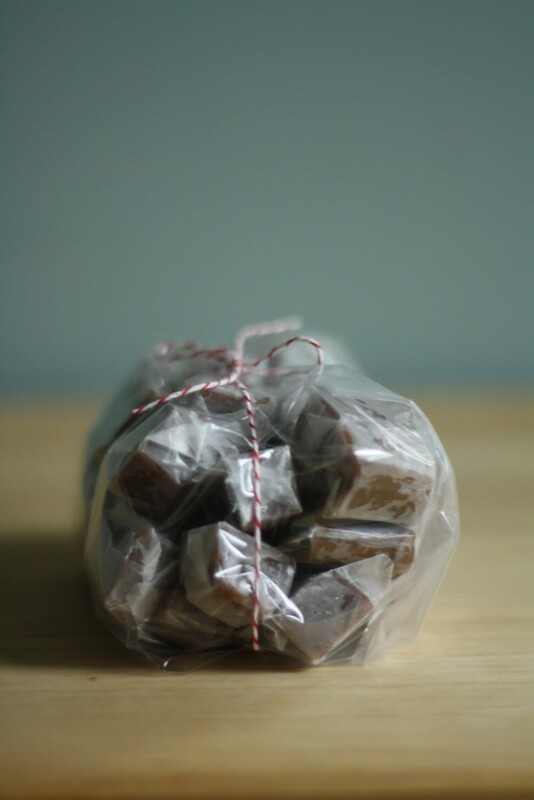 When these caramels entered my life at a wedding this summer, I knew that it was finally time to lady up and make them. Sweet and salty – they were the perfect handmade treat. They would also make an excellent little holiday hostess present. Line an 8-inch square pan with two sheets of parchment paper so that there is a bit of overhang on each side. In a medium saucepan over medium heat combine the cream, corn syrup, salt and vanilla seeds until mixture begins to simmer. Remove from heat, cover, and let sit for 10 minutes. 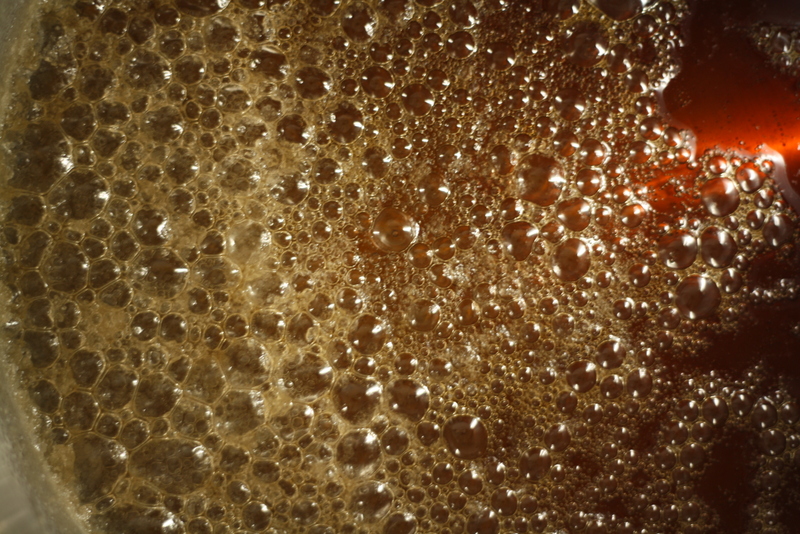 Stir together sugar and water in a large saucepan. Heat over medium-high heat, without stirring, until the mixture turns a dark amber color and a candy thermometer reads 370 (this will take a while). 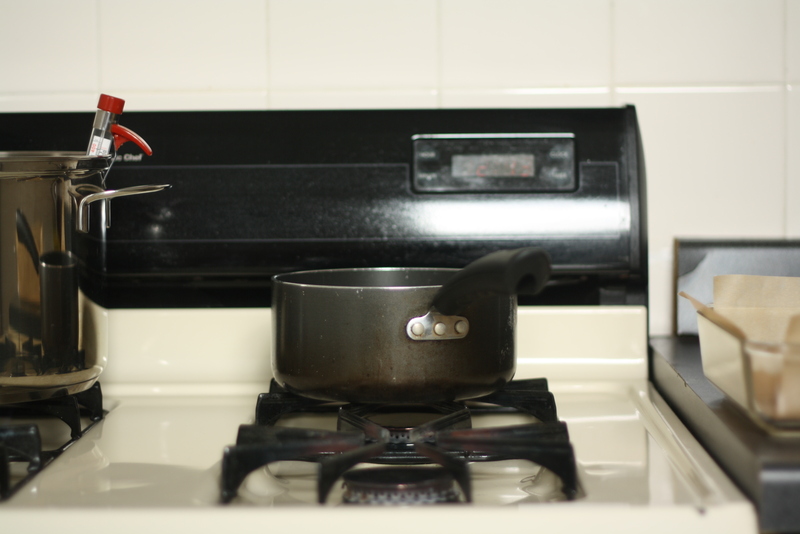 Remove the pan from heat. Slowly (watch out! It will sputter and splash a bit) pour the cream mixture into the caramel mixture. 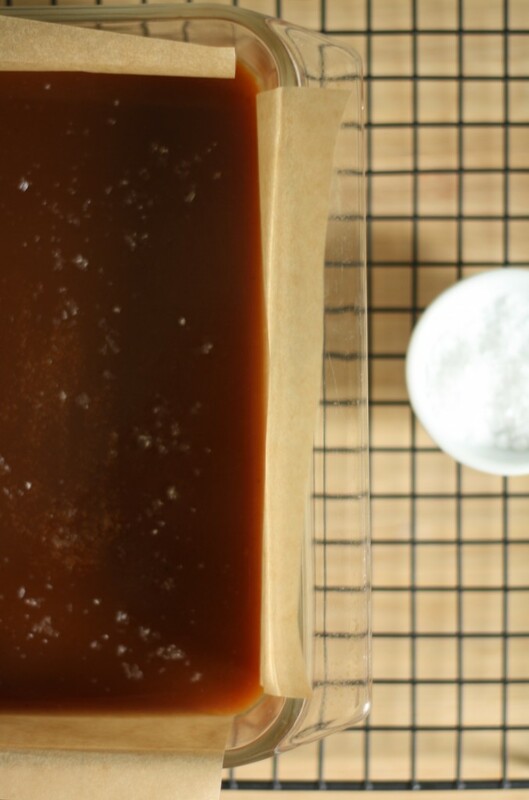 Return the mixture to medium heat and stir until caramel dissolves and becomes smooth. Cook, without stirring, until the candy thermometer reads 246. Pour mixture into the prepared pan and then let cool completely. 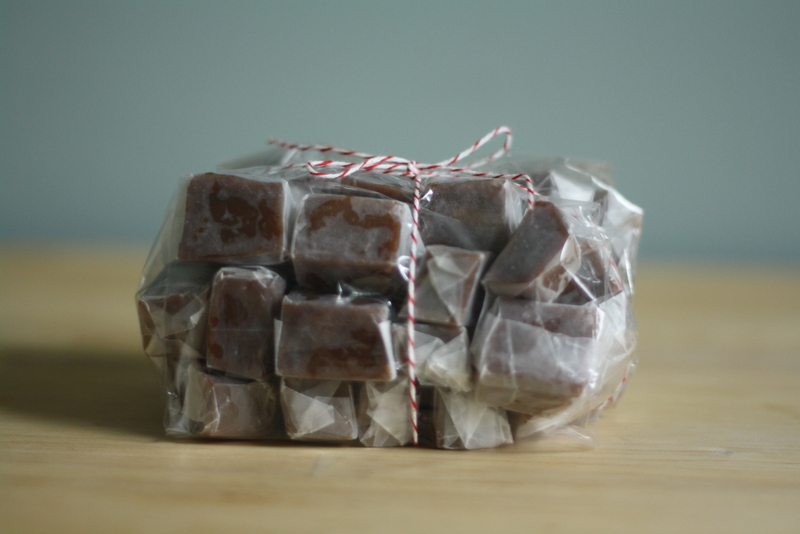 Cut into 1-inch squares, sprinkle with sea salt, and wrap individually in wax paper squares.